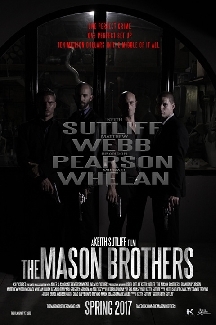 Writer-director Keith Sutliff’s The Mason Brothers will get a theatrical release, beginning in Los Angeles, April 14. The film, about a group of outlaws that attempt to reveal their brothers killer from a neighboring gang after being set up during a bank heist, features Brandon Pearson, Matthew Webb, Michael Whelan, Julien Cesario, Chris Park (Sons of Anarchy), Nazo Brava and Sutliff, who also makes his directorial debut on the KS PICTURES LLC release. Sutliff’s film, the script of which was inspired by Brian De Palma’s The Untouchables and Reservoir Dogs, will premiere at the Egyptian theater in Hollywood on April 11 followed by a limited, multi-theater theatrical release beginning April 14.